Social sciences have questioned the paradigm of trauma, enhancing the social and cultural filters that underlie painful memory at the collective level, but individual and family interactions are still hegemonized by a psychological reading. This talk challenges the universal model of traumatic silence that risks overshadowing local conceptualizations of the self. Drawing on an ethnography carried out in Istanbul, it examines the experience of silence in Turkish former revolutionaries’ families, the main victims of the 1980-1983 military coup. For leftist movements and families, the 1980 coup is the biographical and political tragedy upon which a mnemonic community is built. They are still in a counter-hegemonic position compared to official historiography and state narratives, but have built a “strong memory” codified through the figure of revolutionary martyrdom in public narratives and rituals. Within leftist families, silence and secrecy are common, even when the past is told. On the one hand, silence is the consequence of the painful experiences lived by former militants; on the other hand, it cannot be reduced to the pre-cultural mechanism of unspeakable trauma. Domestic silence and secrecy should be understood in relation to the present and not to the past: they do not prevent emotional interactions but are a practical knowledge through which parents teach second generations to perform a specific self in a public space which is still perceived as repressive. Moreover, silence over personal issues stands also in relation to a morality of “not saying”: it is part of a poetics of the self that is bound to the ethos of revolutionary fighter, whereby “telling is almost like crying”. 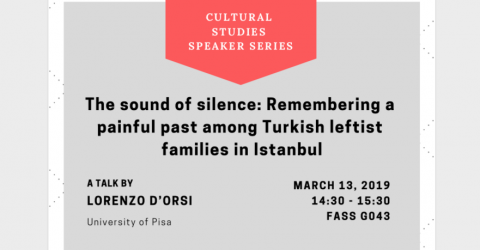 This talk also focuses on the generational gap, and shows how second generations often re-read their parents’ silence according to global memory frames, interpreting it as a “traumatic” element. For new generations, the language of trauma is a familiar cultural idiom which also allows them to extend social solidarity and partly break their marginality in an over-politicized memory field.